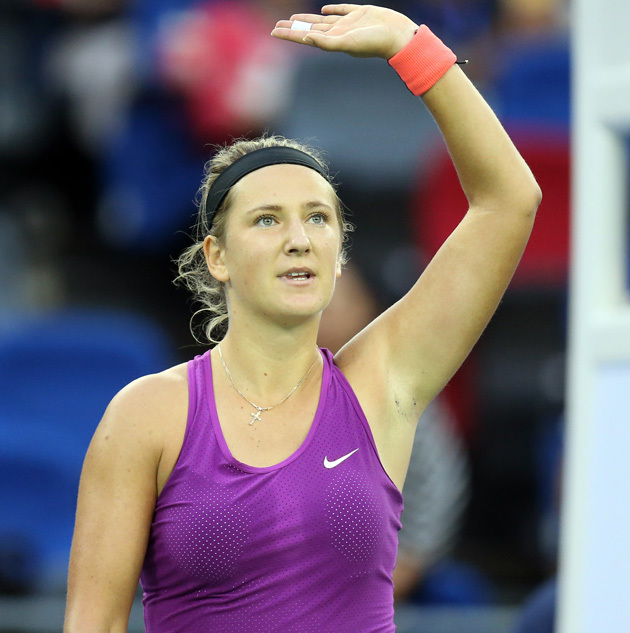 In an exclusive to SI.com, Victoria Azarenka assesses her 2015 season tournament by tournament, including details about her battles with injury, coaching changes and more. At the end of every season, I try to create an assessment of my year while it is still fresh in my mind. Unfortunately, that moment came earlier than I wanted this year: in Wuhan, when I had to retire from my second round match. The realization that this injury put an end to my 2015 season is a bit daunting. Vika, you are done! I couldn’t play in Hong Kong, which was something I had been looking forward to. So the only thing I can do at this point is try to stay in the present, in the now, and figure out what’s next. I am upset, disappointed, sad, but…it is what it is. The best thing about our sport is that there is always a new season, a new tournament, a new chance. I arrived to Wuhan with a positive mindset, ready to go. Or so I thought. What I kept ignoring was the pain I’ve had in my foot throughout the year. I’ve managed to play with the pain for most of the season and tried to focus on my performances at the Grand Slams. But as hard as I try to ignore it, the pain is present and I can’t put it out of my mind. Those who are close to me know that I don’t like to talk about my injuries. I try not to acknowledge them until I absolutely must. I try to deal with pain and discomfort as best as I can, play through it, train through it and pretend that it’s not there. One thing I learned is that sometimes that is not the wisest approach. I learned that the hard way. In some situations, there is no such thing as magic healing and sometimes you just have to listen to the injury and try a few different options. Taking time off should always be one of them. Now, why did I play in Wuhan then, you may ask? I will tell you shortly. The beginning of every season is always very exciting for me, especially because I adore Australia. Not only because I won two Grand Slams there but because it was love at first sight for me with Australia. The atmosphere is amazing, the fans are highly passionate and there is such history and appreciation for the athletes. The list of my love for the country is endless. I even love it when it’s really, really, really hot! When I came to Australia in January, it seemed to everyone that I had everything in place to start The Comeback. But for me, it didn’t feel exactly that way. Every time I went out on the court, I was dealing with a new unknown feeling. Was I nervous? Yes, I am human, but I was excited to see what it would feel like the next match and if that feeling were to come back. Well, I have to admit: my ego came along with the nervousness. (And if someone tells me great athletes in their sport don’t have egos, I will never believe that!) Having an ego—a sense of pride—is what makes an athlete great. That ego reminds you that you’re the best and nobody can beat you. Having a healthy ego is absolutely necessary to reach the top. Since becoming World No. 1, I clearly didn’t leave a lot of room for mistakes. The fact that I had to go back to battling and hustling at the beginning of every match was now weird to me. I tried to fight through it and do whatever was necessary to feel like myself again on the court, but somehow I couldn’t fully connect to my old self. This was definitely a new experience for me. After Australia, I had to deal with a very new reality: a new coaching situation I didn’t expect. I will not lie and say it was easy, but now that it’s in the past, I am glad for it. After Australia, my world as I knew it for so many year ended. I needed to find a new coach. And that was the beginning of many changes and adjustments I would see throughout my season. Here is how the adjustments started. To clarify once and for all, Sascha Bajin and I started working together after he decided to stop working with Serena. Prior to approaching Sascha, I contacted Serena to make sure that she was OK with us working together. Being honest is the only way to do business in my opinion. Then Wim Fissette came on board in Doha and we had a great personal connection, something that is imperative for me to have with my team. I didn’t know much about him as a coach and he only knew me as a former competitor. Wim and I had a good start, which was a very different experience compared to my past. Then Sascha came on board—yet another adjustment. I didn’t know much about him other than his role as Serena’s hitting partner and as a very cool guy I’ve seen on Tour for years. He only knew me as a cool girl (I hope?) and a major opponent. We all began to get to know each other and it was definitely fun! During the American hard court swing in Indian Wells and Miami, there were some inconsistencies. I was definitely not in a situation where I could perform my best. With all of the changes I had to endure in such a short period of time, I didn’t realize how much of an emotional toll it took on me. And this was just on the court! My father underwent surgery right after my trip to Australia and that had a big emotional impact on me and added yet another layer to my unsettled state. During times like these, I tried my best to remind myself how fortunate I am to play tennis, my most favorite thing in the world. Yes, there was an annoying pain in my foot. Yes, my team was brand new and I didn’t feel myself on the court just yet. But I still had this gift I am so grateful for. And week after week I had the opportunity to put it to the test at yet another tournament. I started working on my serve, trying to get back to it being a major weapon in my game. It was starting to go in the right direction! 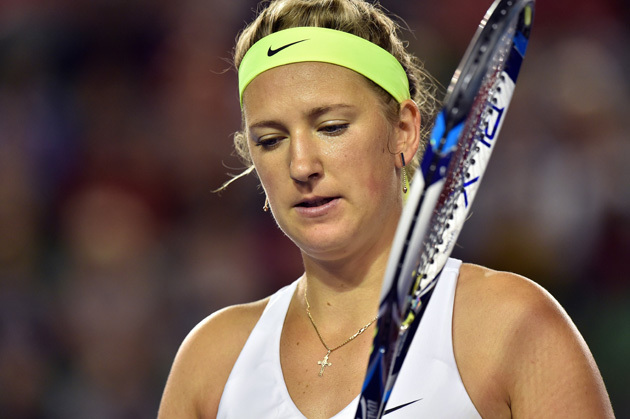 I flew around the world to Japan to play Fed Cup and enjoyed it so much. While I’ve always been proud to represent Belarus, this time it felt even more special. I loved every minute of it, bleeding my flag’s colors, green and red. Next stop was training in Croatia—a beautiful country Sascha knows well. I fell in love with this magical place and made a few new friends and hope to return to soon. Next up were Madrid, Rome and Roland Garros…clay and slide, clay and slide, all day long. During my match with Serena, I had match points—I was close, but in the end, I didn’t have enough to beat her. There is a reason she is No. 1: She finds a way to win every single time. But it was yet another step forward and my patience for my progress was very much tested yet again. I could have gotten really upset about that match, but I chose to see it as a sign: a sign that there was more I had to do to get better, a lot more to learn. For me, if I keep believing in myself and keep fighting for it, I know I can make it happen, no matter what. Why? Because I believe in myself and nobody can put a limit to what I can achieve. The grass is supposed to be greener, right? Well...it actually was! I had a good Wimbledon, with consistency and quality matches. Yet again, I ran into Serena. Our quarterfinal match showed an amazing level of women’s tennis. The better player won that match and showed me that while you can be close, it’s not enough until you get better. Serena once again made history—not only for tennis, but for all female athletes. But she was still better. Noted. Let’s go! Hard courts…I like you. Before the U.S. Open Series began, I had three weeks to prepare. More changes in my life. I moved into a new house. While it’s not fully furnished yet, I love it. Anyone who has ever built a house from scratch knows that the final process is the most painful, yet truly enjoyable. Then a new-old person joined my team—my physio Jean-Pierre Bruyere. Are we done with changes yet? No! Another change: I switched my representation agency from Lagardere to IMG, an important and exciting move for me. I have to thank Lagardere and John for our work together. You signed me when I was only 14 years old and we had a pretty good run. We moved on to Toronto, where Sascha was completely preoccupied with trying to find Drake on every corner. In Toronto I played well but I learned again how stubborn I can be, which basically cost me the tournament. I played well in Cincinnati and my game started to come together. My eyes were on the prize—the U.S. Open became a priority now. The U.S. Open is one of my alltime favorite tournaments. I’ve had great matches here, and again, I left New York knowing that while I made great progress, I still need to improve. I am certain that not a lot of tennis fans were expecting an all-Italian U.S. Open final, but both Flavia and Roberta deserved it so much. In New York, I had a great team meeting during which we discussed all of the improvements we made during the year. My mind once again started to waver and took me to my purpose, a bigger picture. Plans, ideas and thoughts…they were all circling in my mind. I told them to stop, to focus on right now, because there are so many things I can do today to get better tomorrow. Finally I found myself Wuhan, yet again getting ready to compete. Sascha and I were practicing and playing a set against each other. I was doing well—I was up 4–2 and things were getting heated. We hate playing against each other because we are both so competitive and neither one of us likes to lose. So I kept taunting him and he got angry. He started to rip every ball and as I ran after it, I felt a sharp pain in my leg. It was familiar—I knew this pain. I had a match the next day and I really wanted to play because I love being on the court. But not like this, not with this constant nagging pain. I knew deep inside my mind that I shouldn’t have gone on the court. I knew what I needed to be doing instead. 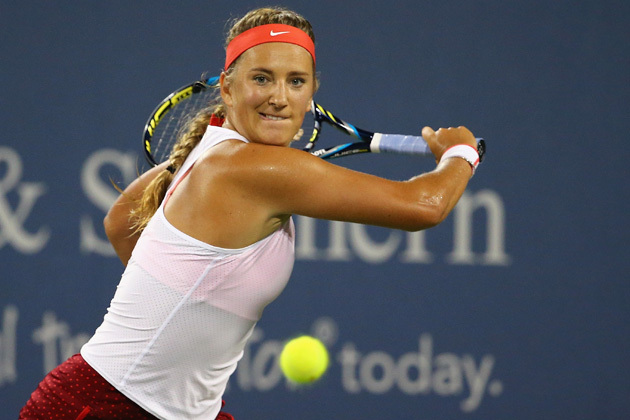 But yet again, stubborn Vika showed up and decided to play. Why? It’s simple—because of the fans. I love my adorable Chinese fans that come to every single practice with #TeamVika signs. They stand anxiously waiting for me to finish, sending good vibes to me, screaming my name in a very cute funny way which actually sounds more like Ouika rather than Vika. But who cares. It’s just lovely, sincere and awesome. The fans are another reason why I play tennis! I play for them all over the world. They stay up all night to watch me play, but I truly want them to understand that I want to play my best and be ready to compete. In Wuhan I made a hard decision. I had to stop and walk away from the tournament and the rest of my season so I could heal my body and be ready for next season. I have a lot of work to do to get close to my best and that’s actually exciting. There is no limit to how far I can go, but I have to be ready. I can’t wait to start again, but first things first: I need to get completely healthy so I can go to work! I wanted to write this letter to myself, so nobody can twist and turn it around. This is me and these are my thoughts! Raw, uncut and honest. I want to say thank you to everyone who supports me every day: my family and friends, my team and of course, all of the fans around the world. And the haters—you play a part in my motivation. Thank you. Ps. These thoughts of mine can turn into something more regular.… you never know!